We nineties children have been sold short on this. With The Fugees all that we were aware of was the chorus: of the song itself, we were left with little impression, and the song is absolutely devastating. It is not, as you might initially think, a love song about a singer. It is a song about the world stopping and painful self-realisation, achieved by hearing the song. 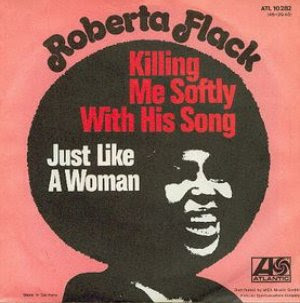 The truth revealed through the song is disturbing, 'killing' to Roberta. It draws her ever closer and closer to an uncomfortable sense of her naked inner self, a process that she cannot draw away from, hence the record's two surprising false endings. "I felt he found my letters and read each one aloud"
It must be one of the quietest American number ones ever - it's mood of devotion realised through the subtle arrangement of organ, percussion and backing vocals. It is upsetting, intimate, and beautiful.